King is a community in southwest Stokes County and was originally named "King's Cabin," for a double log cabin owned by Oscar King. The present name was adopted with the coming of the CF&YV. I stopped there on my way back to Raleigh during my first visit to the region. There was a small feed mill on the tracks, though I don't know if it ever shipped by rail. Mr. McClanahan, a resident from 1957-1975, told me that he doesn't believe it ever did. I stopped at the "Tiny Diny" for dinner (I found good barbecue and friendly people there). Unfortunately, it was too dark at that time to get a good photo of the mill. On my second research trip, I got photos of the town and mill. Besides the mill, there is a wood mulch distributor which is definitely served by the Yadkin Valley RR. Here are some images of the station and the town I have collected. "In the 1965 photo, you are looking to the NW towards Pilot Mt and Mt. Airy. 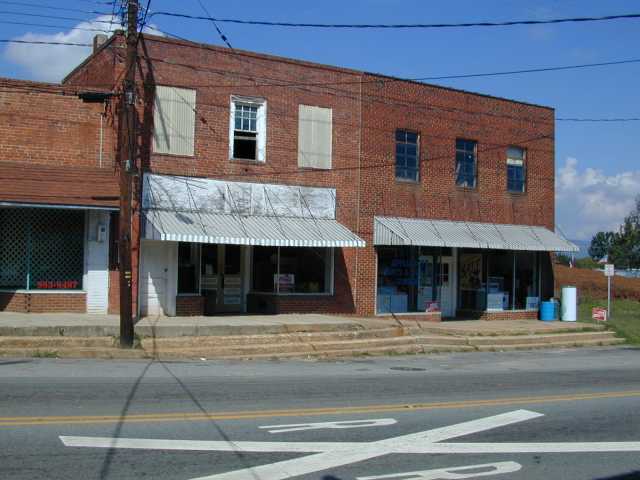 My grandparents' general store was out of view to the left. I used to play on these tracks as a small child. We would get coal for heating the potbellied stove in the store from a coal car on this siding. The SOU station closed with Mr. Rains' [station agent] retirement in the mid-'60's. Up until then, we received express at the station. The siding was used as a team track for some time further." The A&Y and later the Southern stopped in King. In 1943, the tracks had the capacity for 20 cars and there was a phone. Train 61 stopped just before lunch at 11:25 AM on its way to Mount Airy. Train 60 eastbound pulled in at 10:15 AM. 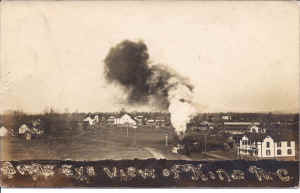 That building to the left in the above photo is still standing. 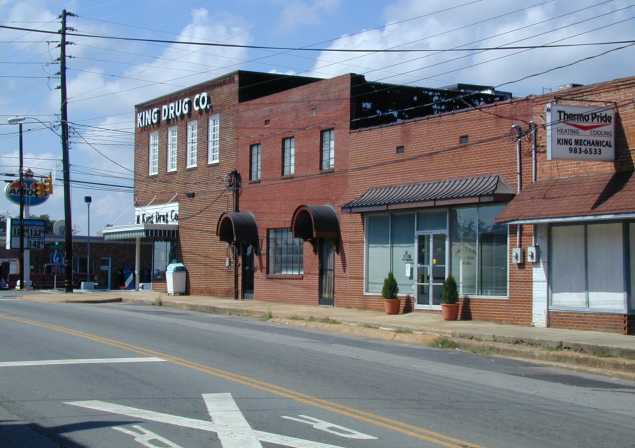 According to Mr. McClanahan, that building (also shown below) was the home of King Furniture through the 1980's. The last agent of the Southern in King, Mr. O.L. Rains, was the father of the owner of King Furniture. furniture factory safes and beds Grales Mfg. Co.
planing mill lumber Grales Mfg. Co. This next photo came from Rick Cromer and is a photograph of the A&Y taken from the top of the old school house which was torn down in 1928 (click on image to see full size view). The A&Y served several industries in King in addition to LCL, passengers and mail. 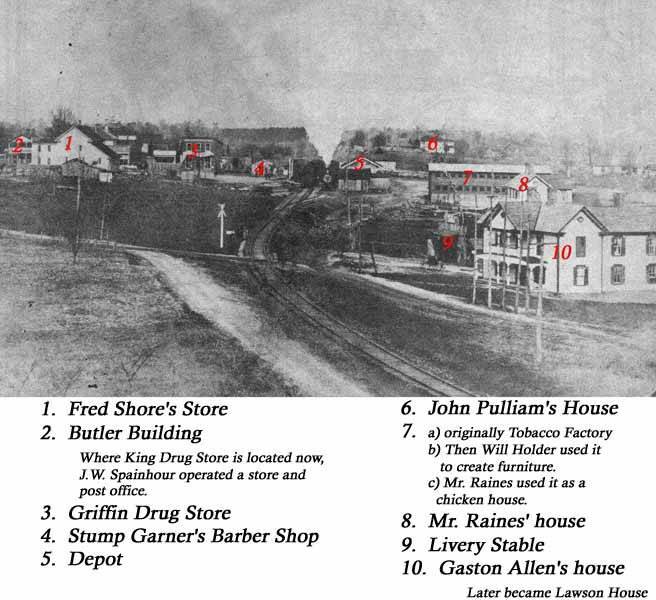 This picture is pre-1915, because none of these businesses in the photo are Mr. McClanahan's grandparent's general store and that store was built in 1915 or shortly after. 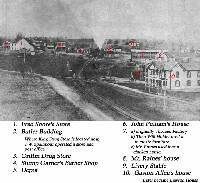 Thanks to Robert Carroll, historian of King and Stokes County and long time friend of Rich Cromer who identified all the structures seen on the photo! Mr. Carroll also said that the picture may have been taken by a traveling photographer and we may not find out who took it, but people are still checking. The second photo (courtesy of Kevin von der Lippe) appears to be taken moments after the one above. The train is closer, but little else seems changed. Here are some photos of modern day King. This shot on the left shows the same old King Furniture building that is in the station photo above. The tracks are just to the right. To the right is the rest of that block of buildings anchored by the King Drug Store. 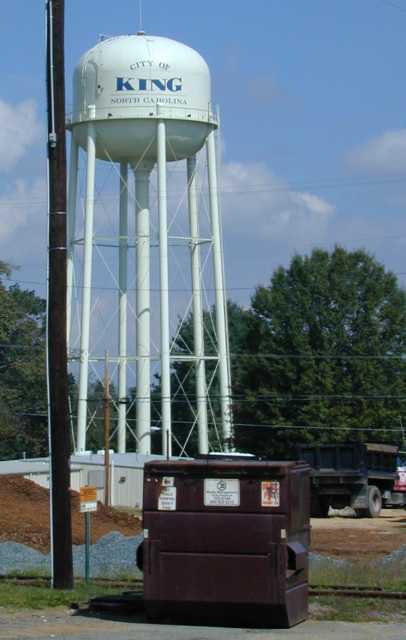 Here's a shot of the water tower. It looks old enough to have existed during the A&Y era, but Mr. McClanahan said it was built in the 70's! Note the tracks in the foreground and the pile of mulch. That pile continues a bit further to the left (north) where King Sand & Supply sheds stand. This is King Sand and Supply which receives shipments of mulch for distribution in the region. Here is a photo of the company storage shed along the tracks which run behind this row of sheds. This shot from trackside shows the siding with a couple of hoppers. It's not clear how they unload the hoppers, unless they just dump on the tracks. My guess is that there was a freight house or something similar here during the A&Y era. I offer these photos to provide some kind of view of King, and just in case somebody prefers to model the modern Yadkin Valley Railway. Now for that feed mill I mentioned. 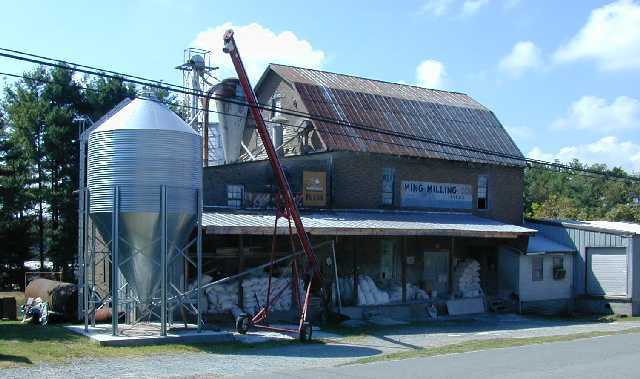 King Milling Co. is located in the south of King. The tracks run right behind. Mr. McClanahan and local historian Robert Carroll state that this small mill never shipped by rail--too bad. 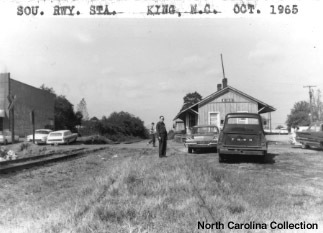 King Milling Co. never did business on a scale that requires railroad service. If anyone is interested in modeling this structure let me know and I can provide you images of all sides of this building. There are a cluster of silos at the back. a. Building of the Chesapeake Bay Bridge-Tunnel at Norfolk. Granite was hauled from Mt. Airy for this project. The granite can be seen in the rip-rap at the man- made islands. b. Building of I-77 across Fancy Gap--inbound construction materials. During both of these, multiple trains per day were frequent. For the 1st, SOU F's and Alco road switchers predominated. The 2nd time, EMD 4 axle road switchers were used. I can barely remember green RS-3's and S-2's being used on the line. The duration of my recall and black paint seem to coincide." I really like talking to people who lived along the line. Thanks to Mr. McClanahan for his insights! If you lived along the A&Y at some point (even in later years when it was Southern or Yadkin Valley) please send me an email. I'm glad to learn all I can! With each contact, I'm getting a better feel for the countryside and towns that the A&Y served!